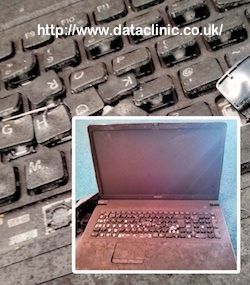 Data Clinic Ltd have been providing professional data recovery services across the UK since 2002. We are the recognised UK experts in hard drive recovery from any type of faulty hard disk drive. Our data recovery capabilities are second to none and we can get data back from practically any type of hard drive failure. Perhaps your hard drive has been dropped and is making a ticking sound, perhaps it’s been involved in a house fire like the laptop in the photo on the left, or perhaps your RAID and server array has gone down and you’ve got a business emergency that requires an immediate recovery response. In all these instances, Data Clinic Ltd is the data recovery company of choice because WE GET YOUR DATA BACK. For hard drive recovery we have 10 regional offices throughout the UK or you can take advantage of our nationwide free collection service that collects your drive from any UK location. Whether you are a private company, public sector organisation or an individual, we have a data recovery service suitable for you. Please select the option that suits you best from the choices below.